Love the sweet and delicious taste of maple syrup? Looking for something fun and educational to do with the family? Take them to see how maple syrup is produced! While most popular during March and April when the sap is running, some facilities offer maple syrup tours and tastings all year long. Many local farms combine traditional maple syruping methods that date back generations with 21st century techniques. Read on to learn more about the maple sugaring process and where you can find local maple producers. Maple syrup was harvested by Native Americans long before the arrival of European settlers in the 1600s. Both the Algonquins and the Iroquois tapped maple trees and harvested the sweet energy-giving sap within. European colonists soon followed suit, boiling and processing maple sap into maple syrup over a fire in a 'sugar shack'. The invention of the tin can in the 1800s advanced the storage of food and soon made it possible to harvest and distribute maple syrup on a larger scale. Dairy farmers would often build sugar shacks and tap their property's trees each spring to supplement their income. This process of tapping, boiling and creating maple syrup went largely unchanged right through the 1970s, when safer and more efficient syruping methods were created as a direct result of the energy crisis. The maple sugaring process typically begins in March when warm daytime temperatures and freezing nights create an ideal environment for the Sugar Maple tree's sap to flow. During this time period, you are likely to see maple sugaring buckets throughout our region and in Vermont. 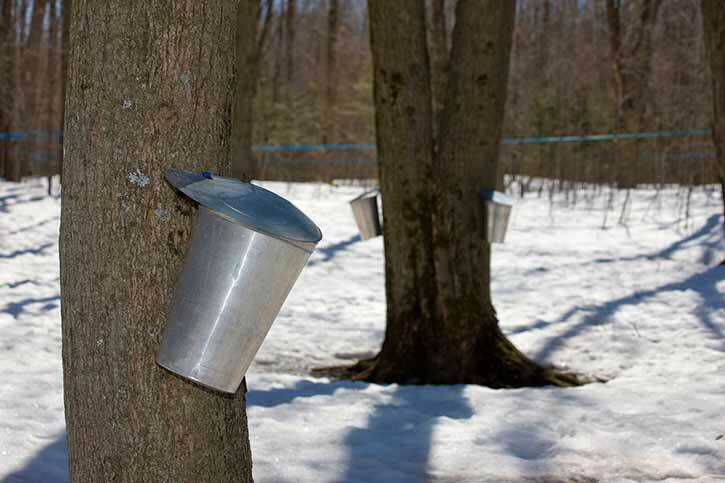 Did you know that it takes over 40 gallons of sap to create just one gallon of pure maple syrup? Where Can You Find Local Maple Sugar Houses? There are several maple syrup producers near Albany and throughout the Capital Region. Some offer tours and open houses only in the spring, and others offer tours and tastings throughout the year. Open year-round, and located in Glenville, NY, Riverside Maple Farms offers free, 30-minute guided tours (with tastings!) Thursday through Sunday on a first come, first serve basis. There is a retail store on-site where you can find a variety of high-quality maple products in addition to syrup, including candy, coffee, kettle corn and more. There's even maple cotton candy! Find out more about Riverside Maple Farms. Mountain Winds Farm in Berne, NY, creates all natural maple products, including syrups, candy, BBQ sauces, vinegars, rubs and more. You can catch them at local farmers' markets and visit them at the farm in the spring during annual maple weekends when they demonstrate the maple syruping process. Specializing in everything maple, Sugar Oak Farms in Malta, NY, has a fantastic store that offers pure maple syrup and products, such as maple jelly, tea, and even coffee. They also have maple gift boxes that would be perfect for a holiday present. This family-owned maple farm in Amsterdam, NY, has been producing pure maple syrup for over 40 years, and visitors are welcome to shop at their maple store year-round. They offer jugs of maple syrup, sugar candies, jelly, granulated sugar, and other sweet treats. 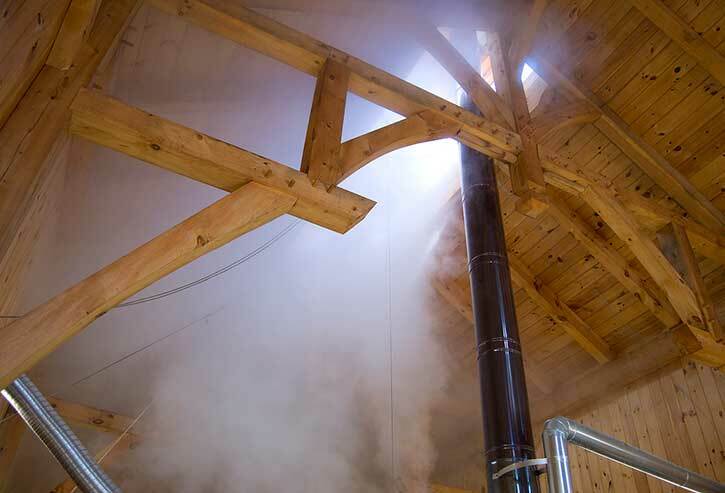 Take a trip to Maple Hill Farms in Cobleskill, NY, and enjoy a tour of their Sap House, which is open year-round (best time is in the spring when they are boiling). This family-owned and operated maple farm features a country store where you can buy syrup, sugar candies, maple cream, pancake mixes, eggs, and more. The owners of Wild Hill Maple in Salem, NY, are passionate about maple sugaring and have been producing award-winning syrup since 2002. If you'd like to learn more about the process, you can contact them and arrange a visit and tasting. Or, stop by their shop and browse the great selection of maple syrup and goods. Located in Salem, NY, Mapleland Farms works hard to produce the highest-quality maple products in New York State. Each year, the farm taps over 600 acres of sugar maples across their property and crafts extraordinary maple syrup and candies. Tours and tastings are available by appointment.